Cromer Hotel Cross Plains Texas. I am submitting this to see if any of your readers remember this building. This is the Cromer Hotel in Cross Plains, Texas. My Grandmother, Inez Cromer Brown operated it from 1947-1969. 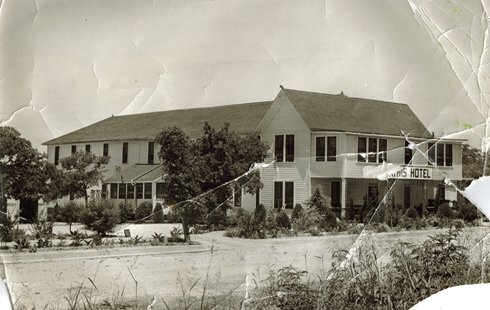 The original hotel was about half this size and was first located in the town of Turkey Creek. It was the Kemper Hotel then. It was moved to the present town site and added on to the size you see in the photo. It was a typical western hotel with about 43 rooms and 2 baths (down the hall). At the time this picture was taken, there was a row of car garages in the back of the hotel. Those were torn down in the 1950's. Two rooms in the 1950's were remodeled with private baths. The regular rooms in the 1960's rented for $2.35 a night and the rooms with baths were $3.50 a night. When my grandmother purchased it the name was the Mathis Hotel. The purchase price in 1947 was $14,000. She sold it in 1969 for $6,000 to get it off her hands as she was getting older and could not care for it anymore. She said it paid for itself a couple of times over before she sold it. The hotel was not air conditioned and was really warm in the summers. The hotel had the original furniture from the 1800's, including brass beds and dry sinks. It even had the original pitchers and bowls from the western era. I can't remember the address of the hotel, but it was located across the street from the fire station in Cross Plains. The kitchen portion of the hotel was located where the "jutting out" portion is on the picture. That was originally the back porch of the original hotel in Turkey Creek. There was a huge dining room in the center of the hotel on the lower level. The menus were set for each day and people from town would come down and pay to eat there. The meals for the "roomers" were included with their rooms. She only would light the hallways of the hotel with 7 watt light bulbs and at one time called to complain to the electric company because her monthly bill had gone over three dollars. Many a trucker stayed at the Cromer Hotel. She rarely rented to women as she said they could "cause trouble." She sold the hotel in 1969 and moved to be near her daughter in Springdale, Arkansas where she passed away in 1973.